Joe Burrill is one of our graduates, who has achieved his goal of quitting 9 to 5 work and becoming a website investor and renovator by the age of just 26. 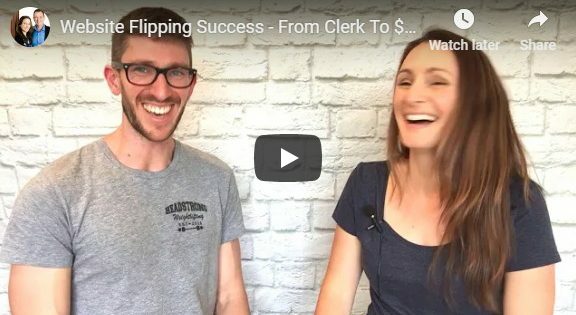 I caught up with him in Australia as he was about to fly off to travel the world and live in Sweden, to hear his secrets to success and how he made the transition to freedom as a digital nomad. Liz Raad: Hi, I’m here today with one of our amazing students, Joe Burrill, welcome. Thank you so much for being here with us. And Joe has had an incredible story. So Joe now makes a full time income online. He buys and sells websites. He started with Matt and I when he was just 23 years old, young whippersnapper, and now he does this full time. He’s a top rated seller on Flipper, he has all three, only person in the world to have all three top badges on Flipper, and he’s about to launch into a whole new phase of life, so we wanted to catch up with Joe before he jet sets off. So welcome, very welcome to you. Liz: And I just wanted to start out, because you know, now you’re full time online making your income, but where did it all start? Where did you start out? Joe: So, when I first started with Matt and Liz, or before I went to the seminar, I was just working as a clerk. Just a customer service for the government. Liz: But you had bigger goals than that, didn’t you? Joe: Yeah, I had a bit of savings saved up and I just needed a place, I wanted to invest that in something, and I came across Matt and Liz, went to their seminar, and yeah, the rest is history. Liz: So you’ve bought and sold, actually, you bought sites within weeks of that first workshop, didn’t you? Liz: Which we didn’t recommend he did. He was supposed to study first. But, what was the thinking behind that? Liz: You certainly did, Joe, and that’s one of the things we really admire about you. You’re just so focused and stuck to your goals. So what were your goals when you first got into this world and started learning from us, what were your goals? Where did you want to get to? Joe: I had two main goals when I first met Matt and Liz. First one was, I wanted to quit my day job. And the second was, I wanted $4,000 per month income. Passive income. [inaudible 00:02:02] portfolio. Liz: Yeah. So Joe started out, he was buying websites. So, how long did that take? What was the process there before you actually achieved those goals? How long did it take you to achieve those goals? Joe: Well, quitting my day job took about three years. Liz: Yeah. So that was when you were 26. Liz: 26 years old, he’s quit his day job. And off online making a living from online. That’s pretty cool, that’s a really big achievement. And when was it, so you actually did that quite gradually, didn’t you? So you didn’t just suddenly turn around and go, “Bang, out I go.” You were very strategic about that, weren’t you? Joe: Yes, yes, I was. When I first started with Matt and Liz, I dropped back a day per week, so I was only working four days per week. And then slowly, I think the next year I got down to three days per week, and then again a little bit further before I actually quit. Luckily, working for the government, they made that nice and easy for me. Liz: That’s awesome. So in the time it takes to do, I know I did a uni degree in three years, and I certainly wasn’t self-supporting by the end of that, and it cost me about 10 grand to not be self-supporting, so well done, that’s fantastic. And so what’s life like now? So you’ve quit your job, you’re working full time online. What’s day to day life like? How much do you need to work on your website portfolio? Joe: Generally speaking I work anywhere be-, well, about five hours per day is generally how much I work each week. Liz: Yeah. But I hear you take some pretty cool holidays, too. Joe: Oh, yeah. Yeah. We try and get out as much as we can. Usually at least two holidays a year. And yeah, we go all over the world. We go to Sweden quite a bit, and went to Colombia just recently, and Mexico. Liz: Yeah. And so what’s it like in terms of traveling, what’s this business like for you when you’re away? How do you manage that? So I know a lot of you are thinking, laptop lifestyle, be able to run your business from overseas, but what happens when you’re in Colombia with no internet? Joe: Yeah, so it’s a lot harder, for me personally. It works for some people, but for me personally I really struggle to work while I’m on holiday. Liz: That’s okay. You’ve had fun. Joe: Yeah. It’s absolutely manageable. Liz: Yeah. And I totally hear you with that one, that’s the same with us when I’m on holiday. We’re out, we’re not working, we’re totally not working. So this is, you’ve found this quite flexible. So you can adjust it. And I know that you are very passionate about some sports as well. Liz: So you get time to be able to do that. Joe: Yeah, yeah. I do CrossFit and I do a bunch of other stuff as well to keep myself fit, and yeah. Liz: So, life’s good. So what’s coming next? Like I know that you’re about to embark on another big adventure, you’re heading off overseas. Liz: Don’t forget the dog. Joe: Indefinitely to Sweden next week, actually. Liz: Woo! That’s so exciting. So you can live anywhere in the world. Liz: And do what you like, be that person and run that business from anywhere you’d want to be. Joe: Correct. All you need is internet and a computer. Liz: Fantastic. Congratulations. That’s so awesome. So what do you think? So a lot of people embark on this journey and say they want to achieve the lifestyle that you’ve now achieved. What do you think the difference is? ‘Cause a lot of people don’t make it. So what’s the difference? Why have you got here, do you think? Joe: For me personally I think the same applies for everyone, is consistency. You can’t start something and fall off the wagon and decide that, “Oh, that’s no longer good for me,” or you run into a roadblock, you encounter some failures along the way. When you hit those roadblocks, you need to know, okay, that’s just a temporary thing, work through it, learn from it, and then keep trying. Don’t let it stop you, especially if you are motivated and you can see that it can work. Liz: So you now, do you feel confident about the future? Like going forward into this digital age, are you pretty confident in where you’re going to head? Joe: Yes, yeah, I feel pretty confident about it, yeah. Liz: Yeah. Well I can see it in you. There’s some exciting things to come. So now your next goal, too, are you gonna grow your portfolio more? Or, what’s your goal there? Joe: Yeah, absolutely. Of course. I’m just gonna always continue to grow my portfolio or my investment portfolio, both websites and otherwise. Liz: Yeah. So you can keep earning and, yeah. Well we’d love to catch up with you again at some point and see how you’re going and hear about the deals that you’re doing, so if you’d be open to that. Joe: Yeah, absolutely. I’d be more than happy. Liz: Fantastic. Awesome. Well thank you so much, Joe, for sharing your story, it is wonderful to have you and it has been amazing having you on the journey with us, as well. We’re always so excited when we have people like yourself who make it happen and really get out there and create the life that you want to create. So I’m glad we’ve been able to help you in some way to get those skills and tools to be able to do that. 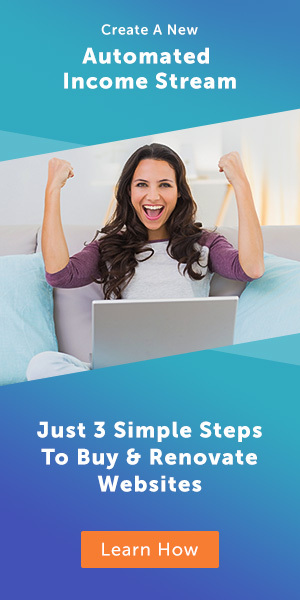 Liz Raad is a website investor, Angel Investor and leading educator in Digital Marketing, and is recognised as the Australian expert in buying, renovating and selling profitable websites and businesses. Connect with Liz on Facebook, or LinkedIn.